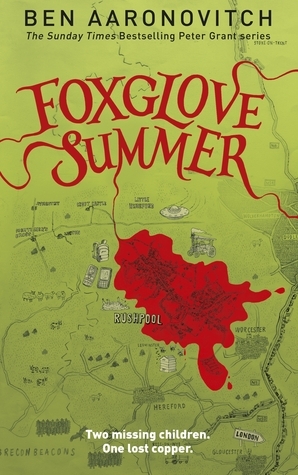 Published By: DAW Books, Inc.
Foxglove Summer is, hands down, the best book in the Peter Grant series so far. Ben Aaronovitch continues to expand the world of supernatural creatures and it all just seems so real. Everything Aaronovitch has created in this book fits together so perfectly that nothing feels out of place and I think that is arguably more important in a fantasy book than a realistic novel. One thing I just have to mention is the unicorns. Yes, there are unicorns in this book and Ben Aaronovitch does a unique, disturbing twist on them. How could you not love a book with unicorns? It is so fun to see Peter Grant out of his comfort zone, i.e. London. And we get to see more of Beverley Brook, one of my favourite characters introduced in the very first book. And I was so happy to see the introduction of Dominic Croft, an openly gay detective who is a fully realized character and not a stereotype. There have been several gay characters in the Peter Grant novels and I love the way Ben Aaronovitch writes them – as real people, not caricatures. If you are like me, and are craving more diverse books, the Peter Grant series has got you covered. I’ve talked about the twist ending of the previous book which was one of the reasons I was anticipating this book so much. We definitely do not get any closure but there are some serious hints dropped about what actually happened, how Peter’s dealing with it, and what’s going to happen next. My prediction: something big is going to happen in the next book and this series will reach truly epic proportions. Sorry if this is all a little bit vague but I don’t want to spoil anything.